As our readers know by now, we love mexi-brunch and we love the West Village. So how had we never been to Tio Pepe for brunch before? A neighborhood institution, compared to most places in the west village, Tio Pepe has been serving Spanish cuisine since 1970. But Chef Jose Zamora who joined the restaurant a couple years ago has since infused Mexican and even French flavors into menu. As our readers know by now, we love mexi-brunch and we love the West Village. So how had we never been to Tio Pepe for brunch before? We’ve probably walked past it dozens of times on West 4th, just west of 6th Ave where the streets start to get diagonal. This time we walked into the busy but not overly packed restaurant for brunch. You could feel the timelessness of the place with it’s simple chandeliers and lanterns on the walls, though it has clearly been updated throughout the years. We started with table-side guacamole that is customized to your tolerance for heat. Ours was a bit mild even though we ordered it medium, but the fresh guac was still delicious and kept us satisfied until the main courses arrived. 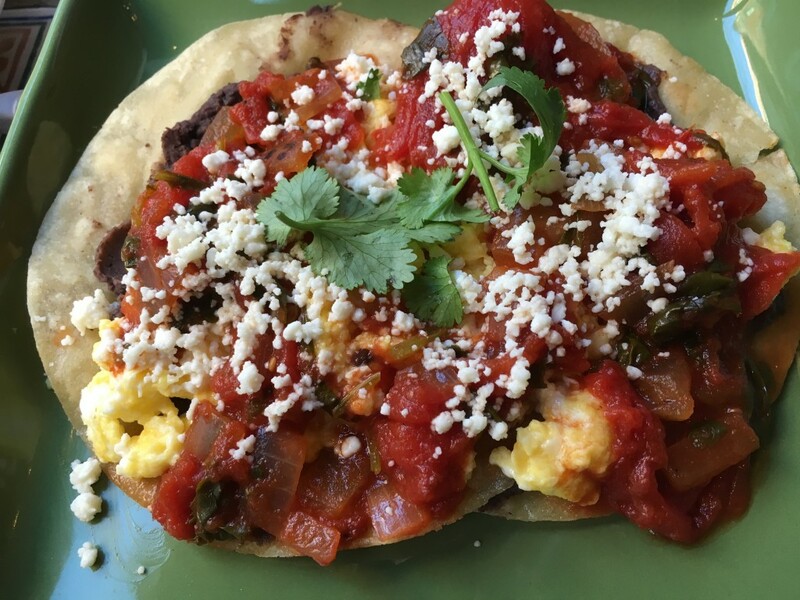 The huevos rancheros was a rich mix of chunky tomatoes, flavorful beans, cheese and eggs your way on top of crispy tortillas. A basic, satisfying version of the classic Mexican brunch dish. The real highlight here though is the Coca, essentially a Spanish flatbread pizza baked in their wood-fired oven. We hadn’t planned on getting a brunch pizza, in fact we were leaning towards the Chilaquiles, but the waiter was so enthusiastic about the Coca that we had to try it. And we’re glad we did. 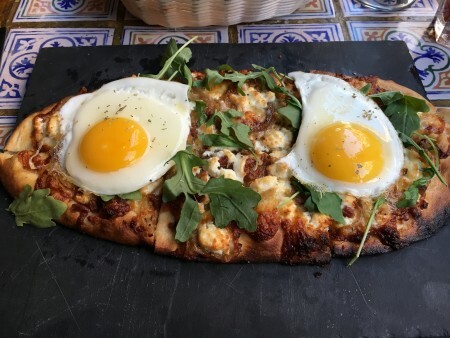 The Coca flatbread included goat cheese, caramelized onions, and bacon topped with two sunny side up eggs. The dough had the perfect balance of crispness and chewiness. We could have even eaten this without the eggs, though the yolk added a delicious savory element to the otherwise sauceless pizza. 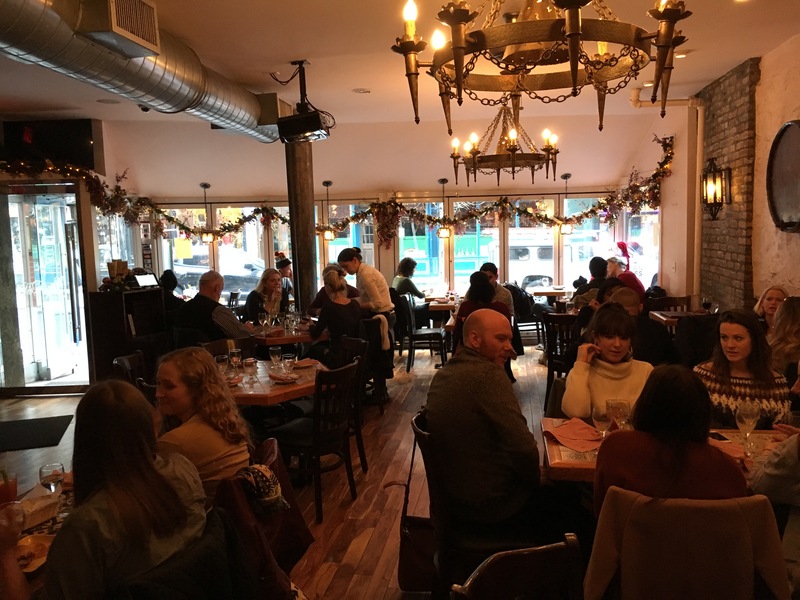 Tio Pepe, while not the type of place you’d rage at, also offers a $10 bottomless brunch for two hours of unlimited mimosas or Bloody Marys in addition to any entree. Perfect for a pre-game to your Sunday Funday or a group birthday brunch, it’s a good value to satisfy those looking for a boozy brunch that won’t break the bank. Insider’s tip: Make sure to request a seat by the window if you want some world-class people watching as you enjoy your meal.